“Let me know if I need to pry it loose,” Judge David Hittner said at the December 17th status hearing for the Civil Trial brought by the family of Sandra Bland. “Pry it loose.” It must have been the third time at least that he had used that particular combination of words in his remarks that day. One could only assume that that particular phrase kept coming to mind because the attorney for the defense kept grinning like a child who has something hidden inside the fist balled up behind their back, while pretending there is nothing there. Yet, you always know by the grin and the smear of chocolate across their chin that there is something there they do not want you to find. That, ladies and gentlemen, appeared to be exactly the strategy of the attorney for Officer Brian Encinia and the Department of Public Safety today. And like a parent with a sneaky child, it appears the Federal Court is going to have to pry open the hand of the State of Texas before they can find out what is inside. When grown men engage in this game of grin-grin, wink-wink, nudge-nudge, however, it is also an appeal for solidarity. People of privilege reminding one another that there is some kind of secret pact that makes them responsible to overlook the small indiscretions of certain men for the greater good of protecting mankind. As his body-language appeals for solidarity seemed to be having no effect on the judge, it was soon evident that things did not seem to be going the way that the attorney for the defense expected. If the reddening of his face and the crossing of his arms was not clear enough, the fact that he stepped, perhaps unconsciously, up to just a couple feet from the judge’s bench made the point. It was fascinating to see that the body language that we use to express our desires does not change greatly from the cradle to the grave. His disappointment was evident, for he had thought he had an ace up his sleeve, when he pulled out the Younger Doctrine within the first handful of sentences that he spoke. (Although, the very first statements made were by the attorney for the plaintiff, Cannon Lambert, who made clear that at this time the plaintiff, Geneva Reed-Veal disputes the cause of death as suicide until the Rangers’ report is available.) After those words, the attorney for Brian Encinia presented the Younger Doctrine (“instructs federal courts to refrain from hearing constitutional challenges to state action when federal action would be regarded as an improper intrusion on the state’s authority to enforce its laws in its own courts”); saying that if the Grand Jury in the State brought indictments the actions of the Federal Court would interfere with the Younger Doctrine. Then the attorneys for the defense, attorneys for the plaintiff and the Judge went around in circles for quite a while. The first circle was about the motion to dismiss. The defense wants the case dismissed. The plaintiff clearly does not. The judge demands answers from the plaintiff that they cannot answer without the evidence from the defense. The defense says they cannot hand over the evidence until the secret proceedings of the DA and Grand Jury in Waller County are finished. The judge asks when will that be? The lawyer for the defense says he has no idea (although it is pretty public knowledge that they are either finished already or about to be finished as they promised a conclusion before Christmas). As entertaining as his performance was, all it seemed to accomplish was to unite the majority of the courtroom in an unspoken understanding that we were watching a child hiding something behind his back while distracting his parents from getting it from him by saying, “Which hand? This hand? Which hand? This hand?” and switching the item back and forth between his hands so as to always present an empty one. The final circular conversation that the room got to witness came from the defense attorney for Waller County. He claimed that the family was refusing to hand over access to Sandra Bland’s mental health records. The attorney for the plaintiff responded that they had no knowledge of mental health records and that they had handed over the medical health records. The attorney for the County insisted that there must be records because they saw some texts on Sandra’s phone that made it sound like she was seeing a counselor. The defense replied that they had seen the same text and had not made the conclusion. The attorney for the defense continued to imply that the attorney for the plaintiff was withholding the records; while the attorney for the plaintiff insisted they would be glad to give them clearance to obtain the records if the defense had any idea who the mystery counselor they had assumed existed from the texts was. Without a name and address, however, the plaintiff could not give clearance to records that they had no knowledge of their existence. As the proceedings ended, it was clear that at least for today, whatever the defense for the State and County had behind their back, they were not going to show it any time soon. Judge David Hittner made it clear, however, that he did plan to pry those fingers loose. So dates were set for the coming year for Summary Judgement, for the Ranger report, for expert witnesses, for the end of motions, for the end of discovery, and for the end of introducing new parties. 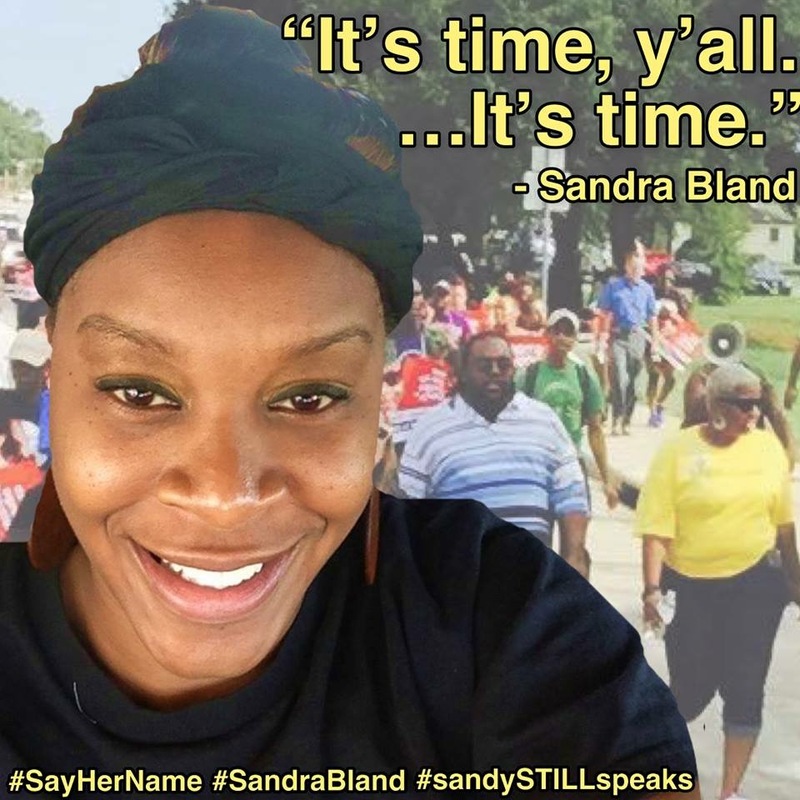 When all was said and done, it became clear that with all the games taking place and the grinning and chuckling, that fist was balled up pretty tight and it was going to take some serious effort to pry those fingers loose from the evidence of what happened to Sandra Bland. In fact, it will take a full year, until January 23, 2017 when a jury will be assembled to examine the contents that have been pried loose. *p.s. Lots of other things happened: promise to strictly apply new rulings Amendment to limit scope of discovery; discussion of verbal/in house conversation that bags were acceptable in cells, but still no written procedure; observation that the US Attorney had made a motion to quash but had chosen not to come to court; discussion of whether the FBI records subpoena complied with regulations for specificity of request; mention of Federal training liability; the words “fact dependent” were mentioned al lot, along with discovery, Monel, Jury selection, and summary judgement. There are few vehicles in the world that I am more familiar with than the Waller County Sheriff’s truck. In the 80 consecutive days that we sat in vigil for Sandra Bland outside the Waller County Jail, I lost count of how many times we saw it parked around the side of the building for the inmates in orange jumpsuits to wash by hand. So when I heard last week that an arsenal of guns, including a powerful machine gun, had been stolen from that same truck, I could not help but wonder how many times those inmates had been within inches of that arsenal without knowing it. It was a sobering thought indeed to realize that even the Sheriff himself was not immune to the creeping fear of Waller County. I had spent months sitting in Waller County before I could verbalize that feeling. The creeping fear. The understanding of your context that grows with time. Wears you down. Remarkable, then, that the Sheriff, who many credit with helping create it, actually felt it himself, for I do not doubt his words. When he said to reporters that he felt the need to carry all those guns partly because of death threats he had received after Sandra Bland, I take him partly at his word. As a woman who carries the Book, I’ve turned to the Book to deal with my own death threats; so I can accept that as a man who carries a gun, he would turn to guns to cope with his. Since recognizing that almost tangible sensation of fear, I have tried to understand what creates or contributes to this atmosphere. The phenomenon was originally discovered when dogs ceased to try to escape after repeatedly being shocked. Even if you turned off the shock fence, they would not try to escape because they had learned they were helpless. This was confirmed in human behavior as well. Learned helplessness is the kind of phenomenon that might develop if a town were to terminate their Chief of Police, only to have him elected Sheriff and positioned in an office less than a mile away from the one he was forced to vacate. That is what happened to Hempstead when R. Glenn Smith was terminated by vote of the City Council, only to be elected Sheriff by Waller County and positioned in an office 2 minutes driving, or 15 minutes walking, from his original post. Learned helplessness might also develop if the media praised that same Sheriff for his transparency and search for accountability, when citizens knew it was anything but that. That is what happened when media praised Sheriff R. Glenn Smith for naming an independent citizen review board to “investigate” the jail after Sandra Bland’s death and to be headed up by what the press described as a Houston attorney who was “not personal friends” with the Sheriff. What the media failed to note was that the Austin St. address of Looney’s offices were actually across the street from the Waller County Court House and that he shared those offices with Judge Trey Duhon who was a personal friend of the Waller County Sheriff. Duhon and Looney were said to have cut ties to avoid any undue influence; yet, if you drive past the Waller County Court House, you will still see this sign hanging. Thus, for those paying attention on the ground, it came as no surprise when Looney came forward later on to say that his review was really just casual and for the eyes of the Sheriff alone for him to do with what he wanted. Many at a distance had been fooled into thinking this was a sign of hope. Yet, it is what has proven to be a classic stalling technique to distract the press and the populace. Another example would be when DA Elton Mathis said that Sandra Bland’s death would be investigated as a murder, then quickly followed it up with a statement a couple days later that it had been deemed a suicide. Yet, that initial statement distracted people repeatedly as it was shared again and again as the months wore on. Perhaps the strongest illustration of how learned helplessness is maintained, however, was the arrest of the Honorable Jonathan Miller. Shortly after he had voted to confirm the naming of the road Sandra Bland was arrest on Sandra Bland Parkway, the Honorable Jonathan Miller, the youngest City Councilman on Prairie View’s City Council, was shot with a taser and arrested in his own front yard. His crime? Questioning why police were hassling his guests in his front yard. The police officers insisted they had very good reason to be questioning his friends; yet, once they had Jonathan Miller tased and on the ground, they told his friends they could disperse and that they had no problem with them. Since that time, the Honorable Jonathan Miller has not been able to be employed in his occupation as a teacher because DA Elton Mathis has neither moved forward with the case, nor dropped the charges against him. Leaving him in a cruel limbo until the timing is right in the press or, more likely, until the press goes away. The message is clear: if this can happen to a City Councilman, why could it not happen to you or your neighbor? Why even try? The fear that I had seen in their eyes was something that I would see and hear again on an almost a daily basis from many in the area of Hempstead who wanted to help or befriend me, but were terrified of the consequences for doing so. What would the consequences be? I do not know; but the terror was real and tangible. I do not have an explanation, that is their story to tell; what I have is an observation. People will say, as they have said, that this is all made up and I am just a really good writer; to which I say: a) Thank you for the compliment b) If people feel authentic fear I am not going to divulge personal details about them in order to prove a point. This fear is kept relevant by small and persistent signs of intimidation. As our vigil for Sandra Bland wore away at people’s fear, the walls protecting the culture of fear were reinforced by small yet public acts of intimidation. Many people are aware of the cycle of intimidation that ran its course and sputtered out between the Sheriff’s department and the Sandra Bland supporters. By that I am referring to the “Church of Satan” – erection of barricades -cutting down of trees – reporting to the FBI – dismantling of toxic barricades – welding of permanent steel barricades – removal of prayer stones – paving of the parking lot – cycle of intimidation through which the Sheriff mysteriously carried out “maintenance” that had been delayed for years or decades in a matter of weeks in an attempt to dissuade our prayer vigil from continuing. What most are not aware of are the men who sat in cars and watched us. The men who sat in cars and followed us. The man who sat watching me in a green car in the parking lot of Hope AME and ominously asked me, “Is this your church?” To which I could most easily reply, “It is not. It is God’s.” We can only imagine that our experience is not an isolated experience. Yet, while our experience of intimidation may not be different, our experience of social media does seem to be. People around the country noticed from the start that there was something peculiar about the social media world of Waller County and the way officials engaged on social media when Judge Trey Duhon tweeted about Sandra Bland from what seemed to be a professional account. Granted, many of us tweet very opinionated or strongly worded tweets on a regular basis; but what was unusual was that it was coming from an account titled @WallerInfo. For many, that was the first time they had experienced a sitting Judge tweeting information and opinions about a case and an individual. The second way that people became aware of the insulated manner of engaging social media was through The Waller County News, a closed and private Facebook group that included the Sheriff, among over 5,000 other members. It’s been reported that the communication that went on within the group seemed to very strongly support locally elected officials and discourage critique. Many who expressed critique reported being removed from the group by the administrators. The result was a social media environment that was insulated from the outside world, and in which local officials utilized social media to increase the fear of the outside world. Just a reminder… this is the real Sandra Bland. a disrespectful, drug-addicted, criminal who was estranged from her family and an out-of-towner to boot. On the other side, are the salaries, careers and futures of locals, along with the potential for a legal settlement that would cost the county financially. Without intervention from the Department of Justice, those who will decide whether any wrongdoing occurred to Ms. Bland will be those who have been immersed in this culture and will have to live with the repercussions or rewards of their decision. Being less densely populated, a rural location provides residents with more limited options socially, politically and economically intensifying all of the factors above. Relationships bear a different value, a different weight when options are fewer. Without the support of those around you, life can be very hard and very lonely; making the avoidance of rifts a high priority. In addition, if you do not like who you have elected into office, you have limited options for who can replace them. Lastly, if word spreads that you are not a friend of the community, it is easier to create financial repercussions. In light of all this, intimidation bears a different weight than it does in a more urban setting. Not perhaps a greater weight, but simply a different weight. Bearing all of this in mind, it should be clear why the people of Hempstead, Prairie View and Waller County merit our fervent support and prayers: most particularly, perhaps, those selected to serve on the Grand Jury.